Wendell, Idaho may be small, but there is always a lot going on in the town. People need transportation to get from place to place, and if you experience a car accident or breakdown, this can leave you stranded with hampered plans in an already busy life. When you are in need of roadside assistance, contact the closest, fastest, and most reliable towing company in the area, Magic Valley Towing. We provide towing services in Wendell and its surrounding areas to get you back to your daily life quickly and without hassle. When you encounter a car problem or accident in Wendell, the last thing you want is to spend hours waiting for assistance on the side of the road. Not only can this be dangerous, it is also unnecessary. With our tow company so close, we can reach you faster and provide you a safe way to get your vehicle off the side of the road and in a repair garage. We even offer repair services for your vehicle to cut out middleman costs, saving you time, money, and headache. We want you back on the road as soon as possible, and with our customer satisfaction guarantee, we promise to meet you on your desires as far as we are able. Wendell is a common stopping place for many semi truck drivers, as the town is connected by many highways and backroads which drivers use to haul their freight. As such, any semi-trailer truck collisions or accidents warrant an immediate response to ensure quick cleanup and professional heavy duty towing. 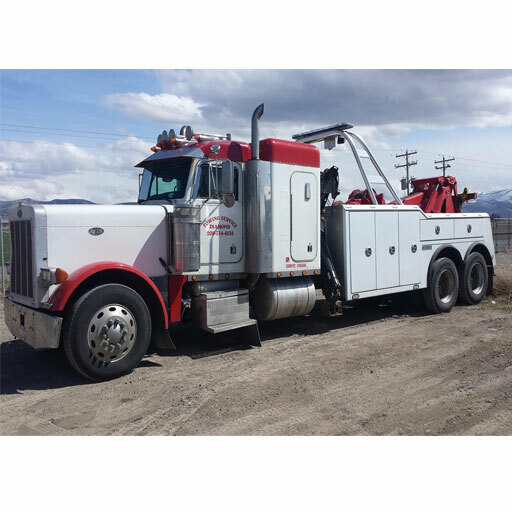 At Snake River Towing, we have the best drivers who arrive on the scene quickly and who are knowledgeable and experienced when it comes to handling large tow jobs. We have all the necessary equipment to clear your big rig off the road as well as help with freight cleanup. Our trained office staff will also be able to help you with any questions you have regarding your tow and can provide any paperwork or documentation your company may need related to our part in helping clear the accident. Our towing business is certified through AAA. This means that we provide all of your guaranteed benefits as a AAA member. Your tow is likely free as a AAA beneficiary, and we will work closely with AAA to ensure that all of the costs associated with your vehicle are covered. We do everything we can to represent the AAA brand’s commitment to excellence, providing you quality roadside assistance and towing services when you find yourself in a tight spot in or around Wendell. Many people worry about leaving their vehicle in the hands of another person, but this will not be the case with our tow drivers. We employ Wreck Master certified drivers to assist you with your tow, which means they have experience and training to handle any towing situation you find yourself in. Whether your car is having mechanical issues or you were involved in an accident, you can be sure that when our professionals arrive on the scene, they will be friendly, helpful, and knowledgeable. Before we leave the scene, we make sure that your personal needs are met and your safety is secured. We can help you find a ride and get your family back inside and out of the elements. When you come into our office, you will be pleased to work with our courteous staff, all of whom are excellent at handling matters like insurance claims and accurate invoicing and towing charges. We help alleviate the stress of an already stressful vehicle situation to make sure you are completely satisfied with our service. Ready to Get off the Road? If you are reading this on the side of the road in Wendell, don’t wait any longer! Get tow it and call us at (208) 734-6138 now. We will send someone to pick you up and help you right when we receive the call. Remember us as the number one towing company in the region. We are here to help you with all of your roadside needs.